Retractable banner stands are the quickest and easiest banner stands to set up and take down making them the most popular style of banner display on the market. With their enormous popularity, there is a huge variety of sizes and styles available, from table top sizes to models that are 10 feet wide. 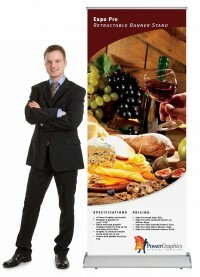 Also called roll up banner stands or pull up banner stands, because that describes how they work, retractable banner stands have a mechanism that winds the banner around a roller in the base as it's lowered. This allows the banner to stay protected inside the stand when it's not in use, which helps prolong the life of the banner when used properly. Usually there is a internal spring that creates the tension that allows the banners to be pulled up and retracted, although a few high-end models don't use springs at all. In every case, raising the banner increases the tension on the roller which helps hold the banner tight while on display, then winds the banner tightly around the roller as the banner is lowered into the base when it's time to take down the stand. 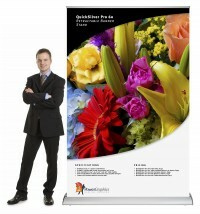 This process typically takes less than a minute, which makes this style of banner display the king of speedy setup and take down. 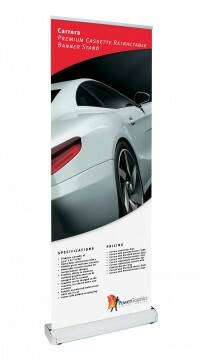 Retractable banner stands are very popular as trade show banner stands, but because they are so versatile, they are also widely used for retail displays. It's very common to see them as promotional displays in stores, shopping malls, theaters, airports, fast food restaurants and at conventions. 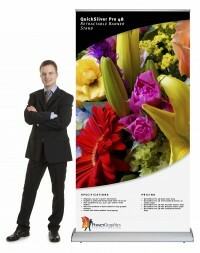 They are especially well suited for displaying promotional messages such as marketing a product or advertising a sale, but they are also great for branding and for directing traffic and wayfinding. Retractable banner stands tend to fall into two main styles. The compact style, which isn't much larger than the internal roller itself, has feet on the bottom that pivot to extend in front of and behind the base to provide stability. There are some high end models that use this base style, but most of the products in this basic shape are the low end models. Cheap banner stands from China in this style have flooded the market, and they all tend to look the same, but there is wide range of quality among the different stands that have this same basic look. The other main style is a wide base stand that doesn't require any stabilizing feet. These tend to be higher end stands, but there are cheap stands in this category as well, just as there are high-end stands in the compact style, so look through all the options, or use our handy comparison chart, to see the different features and quality levels of each product. 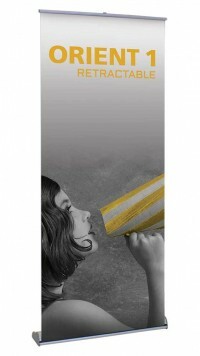 We offer a wide range of retractable banner stand models so that we have styles and sizes to fit every need and budget. Even our cheap banner stands are an excellent value for the money and are better made than competing products costing twice as much. 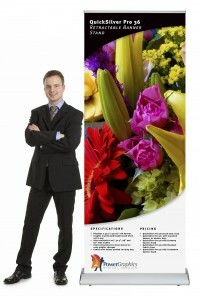 In addition to selling the major brand name models at excellent prices, we also offer our own models of banner stands. The Budget Roll Up, Econo Stand, QuickSilver Pro, Expo Pro, Carrera, and Sterling are manufactured specifically for us which allows us to choose which features are included with each model. 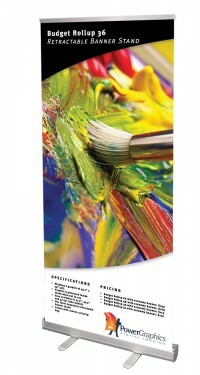 Features like a range of widths, lever lock telescopic poles, adjustable tension control, or banner mounting that requires no adhesives or special treatments are the types of things our models have that are missing from competing products in their respective price ranges. Because we found these features were either not available at all, or only available on high end stands costing two to three times more, we decided to have these stands manufactured to our specifications so we could offer these popular and convenient features in stands that were more affordable. 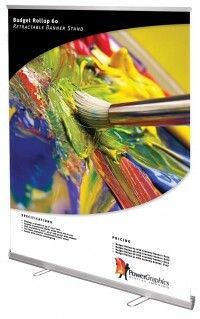 Having them manufactured specially for us enables us to sell them directly to our customers with out extra markups, which is why we can offer them at such excellent prices. 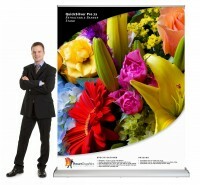 Unlike other companies, we provide honest ratings of all our banner stand models. Most of our competitors have copied our rating system, but instead of providing honest, accurate information, they alter the ratings and even misrepresent the features of other stands to make their models, or the models they need to sell, look like the best options. We don't do that and our feature listings are accurate and our ratings are based on actual personal experience with all of these products. 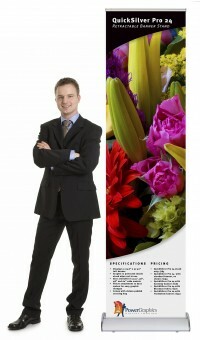 What most companies sell as "Luxury", "Deluxe", or "Premium" banner stands are what we call Standard quality. 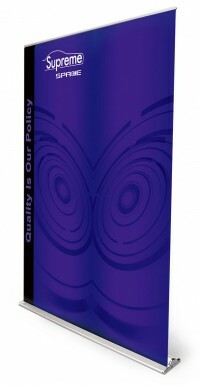 The banner stands we rate as Standard quality are good products, but there is a definite distinction in quality and features between those and the stands we rate as Premium or Professional. 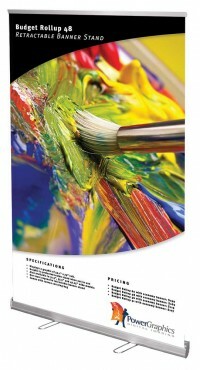 Don't be misled by ratings from other companies, as not all stands that are advertised as Premium actually are. As always, feel free to contact us for help or recommendations.